DIFFICULT TO FIND MCCOY CREAM PITCHER! 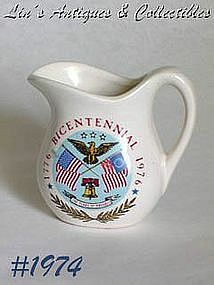 WHITE PITCHER WITH COLORFUL 1776-1976 BICENTENNIAL ARTWORK ON FRONT. MEASURES 3 3/4" TALL (AT TALLEST), MARKED ON BOTTOM: USA. NO CHIPS, NO CRACKS, NO CRAZING! EXCELLENT COLLECTIBLE.